(CNN) -- Kumi Naidoo has only just decided what he'll eat for breakfast. It's an important decision; it will be his last meal in 21 days. 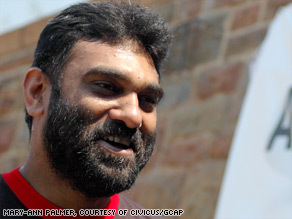 Kumi Naidoo, honorary president of CIVICUS, will fast for 21 days as part of a "rolling" hunger strike. "I think I'll probably have a mango and some orange juice," he said. "I don't buy my doctor's advice on just beefing up. I know the first three days is going to be really hard so I don't want to pig out." Naidoo, the honorary president of civil society organization alliance CIVICUS, is one of up to 40 public figures in South Africa starting a hunger strike or fast this Wednesday to draw attention to the plight of millions of Zimbabweans who suffer severe food shortages every day. It's the first offensive of a new campaign dubbed "Save Zimbabwe Now." Visitors to the Web site are invited to join the fast and sign a petition demanding action from South African President Kgalema Motlanthe. It's envisaged the hunger strike and fast will last for three months or until a list of six demands are met. They include an appeal to the South African Development Community (SADC), the African Union (AU) and major political parties in the region to end their policy of quiet diplomacy on the issue of Zimbabwe. The second demand calls for an urgent response by the United Nations and the international community to Zimbabwe's humanitarian crisis. The third demands an immediate end to the "abductions, torture and other sinister forms of intimidation against civil society and political activists." They want the SADC to grant refugee status to Zimbabweans fleeing their own country, and they're urging Zimbabwe to lift restrictions on freedoms of expression, association and assembly. The sixth and final demand calls for the transitional authority to be installed if a power-sharing deal can't be reached in Zimbabwe by the end of February. "The sad thing is that if you go through these demands most of them could be met very easily if there was a political will," Naidoo said. He's under no illusion that the six demands will be met within 21 says, which is why the campaign has taken the form of a "rolling" strike, intended to build momentum along the way. "The whole idea here is to actually encourage thousands of people -- around 100,000 -- to get involved and to keep it going," Naidoo said. The hunger strike started quietly in early January when Pastor Ray Motsi from the Central Baptist Church in Bulawayo, Zimbabwe swore off food for 21 days. His fast finishes on Sunday, by which time Kumi Naidoo will be over the worst of his initial hunger pains. Naidoo will be slowly reintroduced to food from February 11, when Nomboniso Gasa, Chair of the South African Gender Commission, will pick up the baton and fast for another 21 days. When her time is up, the idea is that someone else will join the campaign to keep it moving. "Maybe I'm a bit naïve but I'm hoping that [there are] a lot of people who have been sitting on the sidelines and have felt really unhappy about what's happening and not knowing what to do," Naidoo said. "The value of solidarity to people who are living under repression should never be underestimated. Just that sense that you're not alone is a powerful thing"
Naidoo is speaking from experience. He grew up in South Africa in the 1980s and as a black teenager attended too many of his friends' funerals. He was expelled from school at the age of 15 for his anti-apartheid activities and fled South Africa in 1986, blaming continued police harassment. He returned after Nelson Mandela's release from prison in 1990 when he helped to set up the African National Congress as a legal political party. The idea for a hunger strike came about during a trip to Zimbabwe in the days leading up to Christmas, 2008. Naidoo entered the country to film "Time 2 Act," a series of personal appeals from the Zimbabwean people for the government of South Africa and the SADC to alleviate their suffering. "The little film we did opens with this young boy who we spoke to who said he had not eaten for eleven days and all he had was water. It was a few days before Christmas and he said 'I don't know if I'll have any food at Christmas,'" Naidoo said. Naidoo doesn't think the "rolling" nature of the strike will dilute its message or make its demands any less urgent. On the contrary. "I think it's more effective to have more people participate and more people to be engaged and more voices to be brought. And I think that has a good chance to shift the public momentum here in South Africa," he said. "I do that the turning point has come -- it can't go on much more. This is a country that is not only putting its own people at risk, it's also putting an entire subcontinent at risk."